Simple, supplement folding bed upon request. 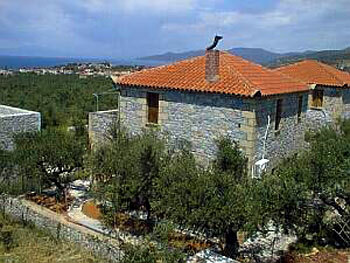 Only 750m above Stoupas main beach lies this really nice house. (~ 100m²). From the first floor you`ll have a great sea view and in front of the house there is a shady place where you can sit. With its two sleeping rooms and the possibility of additional beds the house has space for max. 6 persons. There is a telephone in the house and by buying a "Chronokarta" (available at each supermarket) you can use it freely. Beside the very well equipped kitchen, the house has a chimney and air conditioning which makes it perfectly suitable also for the off season. Aside from the great view onto Stoupa's famous landmark called "Kastro", you can see whatever happens all along the coast.